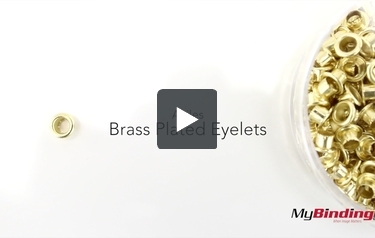 These high quality brass plated eyelets are designed for use with the Akiles eyelet punch. Each eyelet measures 4.8mm x 4.6mm and can hold up to 30 sheets of 20lb bond. These eyelets are packaged with 250 per bag and offer an excellent, economical way for you to bind your documents, samples or other items. Check them out today. These are Akiles Brass Plated Eyelets! When hanging a project, use these eyelets to protect your project from extra wearing and potential tearing. They are specifically made to be used with the Akiles Hand Held Eyelet Punch. It can hold together up to 30 pages, and it does so very securely. And of course these eyelets allow you to hang your projects on hooks and pins for easy displaying. To use, place an eyelet into the press face down. Then insert your project -face down- through the eyelet. Press on the handle firmly to apply the eyelet to your project and hold it together. Here is look at the finished product. It’s a simple product, but is attractive and very useful for hanging projects. 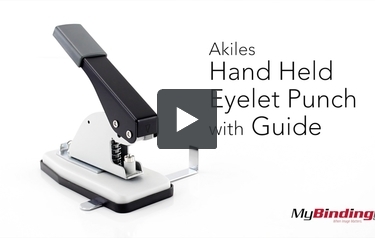 This is the Akiles Hand Held Eyelet Punch with Guide! To start, first insert the guide into the bottom pad. On the guide is a hole, if you align the measurement mark closest to it with the edge, then you can use that as a guide to mark were you want to punch. By moving the margin adjustment all the way back, this is the same distance as the mark just made(or use any other margin you wish). Center your project and adjust the guide to insure the punch placement. Then insert your project in the bottom slot and make your punch. Here is a look at the maximum and minimum margins. Empty the trimmings from time to time by lifting up the bottom pad. This specifically uses Akiles Brass Plated Eyelets (sku AKAEP-EBR). To apply the eyelet, place one into the press with the smooth rounded side down. Then insert your project face down into the eyelet. Firmly press on the handle to press the eyelet together and secure itself to your project. Here is a look at the front and the back of the finished product. Also, compared to a standard three hole punch hole, we can see that this punches slightly smaller ones. Now you can safely hang or hold your project without worry of ruining your material!